Dermira and Christian Siriano Collaborate to Inspire People Living with Excessive Underarm Sweating to Feel Confident in Their Own Skin | Dermira, Inc.
MENLO PARK, Calif., Oct. 02, 2018 (GLOBE NEWSWIRE) -- Dermira, Inc. (NASDAQ: DERM), a biopharmaceutical company dedicated to bringing biotech ingenuity to medical dermatology by delivering differentiated, new therapies to the millions of people living with chronic skin conditions, today announced its collaboration with Council of Fashion Designers of America, Inc. (CFDA) fashion designer Christian Siriano for the Check Your Sweat educational campaign. Check Your Sweat is designed to raise awareness of excessive underarm sweating, or primary axillary hyperhidrosis, a treatable medical condition. 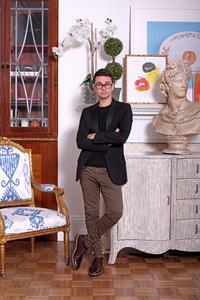 Mr. Siriano, recognized around the world for his inclusive and relatable approach to dressing others, is fiercely passionate about helping everyone feel confident in their own skin regardless of shape, size or sweat severity. From October 2 – November 30, Mr. Siriano and Dermira invite sufferers to submit their ‘sweat stories,’ sweat-free (or totally sweaty) selfies and their tips for managing hyperhidrosis on CheckYourSweat.com/share-your-story. The first 50 people who share their stories will receive a sweat-friendly shirt courtesy of specialty clothing brands Lawrence Hunt or Thompson Tee. Mr. Siriano will also be sharing his “Styling for Sweat” tips to help people with primary axillary hyperhidrosis dress more confidently, including wearing clothing that allows skin to breathe and looking for dark-colored shirts or big patterns to minimize the appearance of sweat. The effort will culminate during Hyperhidrosis Awareness Month in November, when Mr. Siriano and Dermira will feature stories from the community to encourage people to speak more openly about their daily struggles with hyperhidrosis. For more information on how to manage primary axillary hyperhidrosis, visit CheckYourSweat.com and follow Check Your Sweat on Facebook and Instagram. Check Your Sweat is a targeted, patient-centric campaign that seeks to educate, inform and provide support to hyperhidrosis sufferers. Through these efforts, Check Your Sweat hopes to elevate awareness about the medical condition and bring sufferers together to let them know they are not alone. Visitors to the site can complete a sweat assessment, which can be used as a discussion guide when talking to their dermatologist about their sweating. Learn more and complete the sweat assessment at www.CheckYourSweat.com and follow Check Your Sweat on Instagram and Facebook. In addition to filings with the Securities and Exchange Commission (SEC), press releases, public conference calls and webcasts, Dermira uses its website, LinkedIn page, corporate Instagram account and corporate Twitter account as channels of distribution of information about its company, product candidates, planned financial and other announcements, attendance at upcoming investor and industry conferences and other matters. Such information may be deemed material information and Dermira may use these channels to comply with its disclosure obligations under Regulation FD. Therefore, investors should monitor Dermira’s website, LinkedIn page, Instagram and Twitter accounts in addition to following its SEC filings, news releases, public conference calls and webcasts. The information in this news release contains forward-looking statements and information within the meaning of Section 27A of the Securities Act of 1933, as amended, and Section 21E of the Securities Exchange Act of 1934, as amended, which are subject to the “safe harbor” created by those sections. This news release contains forward-looking statements that involve substantial risks and uncertainties, including statements with respect to Dermira’s goals of: bringing biotech ingenuity to medical dermatology by delivering differentiated, new therapies to the millions of patients living with chronic skin conditions; raising awareness of primary axillary hyperhidrosis; building a community that helps people suffering from primary axillary hyperhidrosis feel confident and supported; helping people uncover renewed confidence through treatments to address their skin conditions; and empowering the hyperhidrosis community to take steps to learn more about their condition and manage it with the help of a dermatologist. These statements deal with future events and involve known and unknown risks, uncertainties and other factors that may cause actual results, performance or achievements to be materially different from the information expressed or implied by these forward-looking statements. Factors that could cause actual results to differ materially include risks and uncertainties such as those relating to Dermira’s dependence on third-party clinical research organizations, manufacturers and suppliers; Dermira’s ability to attract and retain key employees; Dermira’s ability to obtain necessary additional capital; market acceptance of Dermira’s potential products; Dermira’s ability to develop and maintain collaborations and license products and intellectual property; the impact of competitive products and therapies, including generics and biosimilars; Dermira’s ability to manage the growth and complexity of its organization; Dermira’s ability to maintain, protect and enhance its intellectual property; the design, implementation and outcomes of Dermira’s clinical trials; the outcomes of Dermira’s future meetings with regulatory agencies; and Dermira’s ability to continue to stay in compliance with applicable laws and regulations. You should refer to the section entitled “Risk Factors” set forth in Dermira’s Annual Report on Form 10-K, Dermira’s Quarterly Reports on Form 10-Q and other filings Dermira makes with the SEC from time to time for a discussion of important factors that may cause actual results to differ materially from those expressed or implied by Dermira’s forward-looking statements. Furthermore, such forward-looking statements speak only as of the date of this news release. Dermira undertakes no obligation to publicly update any forward-looking statements or reasons why actual results might differ, whether as a result of new information, future events or otherwise, except as required by law. 1 Doolittle, J., Walker, P., Mills, T., & Thurston, J. (October 15, 2016). Hyperhidrosis: an update on prevalence and severity in the United States. Accessed October 04, 2017, from https://link.springer.com/content/pdf/10.1007%2Fs00403-016-1697-9.pdf. 2 Kamudoni, et al. The impact of hyperhidrosis on patients’ daily life and quality of life: a qualitative investigation. Health and Quality of Life Outcomes, 15(1). 2017. 3 Glaser, D. A., Ballard, A. M., Hunt, N. L., Pieretti, L. J., & Pariser, D. (2016). Prevalence of Multifocal Primary Hyperhidrosis and Symptom Severity Over Time: Results of a Targeted Survey. American Society for Dermatologic Surgery. Accessed on February 28, 2018, from https://www.ncbi.nlm.nih.gov/pubmed/27879523. 4 Hund, M. (2002). Definition of Axillary Hyperhidrosis by Gravimetric Assessment. Arch Dermatology, vol. 138, pp. 539-541. 5International Hyperhidrosis Society. (2016). Diagnosing Hyperhidrosis. Accessed October 04, 2017 from https://www.sweathelp.org/home/diagnosing-hyperhidrosis.html. 6 Bahar, Rayeheh, et al. The prevalence of anxiety and depression in patients with or without hyperhidrosis (HH). Journal of the American Academy of Dermatology, vol. 75, no. 6, 2016, pp. 1126–1133., doi:10.1016/j.jaad.2016.07.001.